Are you getting ready to head off on holiday, perhaps to a sun-kissed beach or to one of the world’s most exciting cities? If so, you’ll need a way to get to the airport, and that is where we are able to help. Instead of braving the Tube or taking a long and uncomfortable bus journey, why not book an airport transfer with us, and make your way to the airport in a comfortable, stress-free way? It’s what many other people do, so why not find out why? 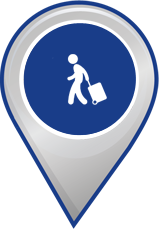 Our airport transfer service is designed to offer three things: great value, comfort and reliability. We know that we’ll beat the quotes offered by many other taxi companies in the area, as we strive to keep our services affordable to everyone. This is really important when you are heading on holiday, as you’ve probably already spent a lot on flights and hotel rooms! These low prices don’t mean that you won’t travel in comfort though, as we constantly maintain our vehicles, ensuring that they are clean and offer a relaxing ride. Our drivers are all instructed to do as much as possible for you – including helping you with your bags – and we can also provide larger vehicles if needed, so you don’t have to squash into a small taxi. All in all, it makes for a far more pleasurable experience than any other form of travel to the airport. We also know that getting to the airport on time is vital, which is why we ensure that our drivers are always at your home punctually, so that there are no last minute concerns about being late. Drivers will know how to plan a route perfectly and avoid traffic and roadworks, and they will drop you off exactly where you need to be. Our airport transfer service is available 24/7, so it doesn’t matter if your flight is at midday or midnight. If you would like to book one of our taxis or minicabs to help you get to the airport on time, please feel free to contact us today, either by calling +44 208 204 4444 or by email bookings@minicabs.co.uk. We also offer a great mobile app for Apple and Android phones, which is free to download and makes booking a taxi incredibly easy. We also offer hotel transfers, school runs and courier services, as well as a whole range of other services. Please contact us today to find out more.